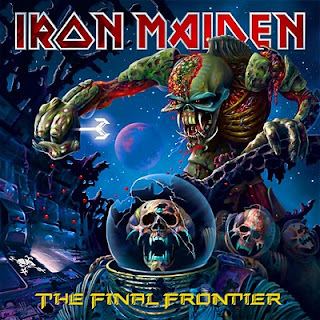 Iron Maiden spin out and land on a planet all of their own, The Final Frontier being a strange far away world where eight minute song lengths are the norm, and tall tales are told with metronomic frequency. Unfortunately, The Final Frontier is also reminiscent of the old Uncle who likes to detain family members in the corner of the room, insisting on loudly recounting, yet again, long-winded stories through yellowing teeth and slightly suspect breath. At ten tracks and close to 75 minutes of music, Maiden are all out progressive, and definitely not looking for brevity, short-cuts or a snappy sound. Most tracks start with glacier-paced intros that last for several minutes before picking up a bit of speed and settling into a mid-paced amalgamation of fragments mostly imported from earlier Maiden albums. The opener Satellite 15...The Final Frontier blasts off with drums that are straight from the jungle and onto the spaceship, while the title-tracked second half of the song stands out with more verve than almost anything else on the CD. El Dorado is a tale of greed told with a reasonably interesting structure held together with a menacing guitar hook. And at the end of the album When The Wild Wind Blows stretches its legs to more than 11 minutes to tell a sad end-of-the-world melodrama. Given the length, it's the most confident sounding track on The Final Frontier, and at its heart enjoys some stellar moments built on folk metal riffs. The Final Frontier is Maiden's 15th studio album, a recording career now spanning an astounding 30 years. The band deserve praise for remaining productive and passionate, and for maturing their sound in directions that match the declining energy levels of men solidly in their fifties. Whether the music remains relevant in the evolution of metal is another debate entirely. Produced and Mixed by Kevin Shirley. Engineered by Jared Kvitka. Mastered by Bob Ludwig.